Tool Blog News C.H. Hanson's new pencil is super. The one tool that everyone needs. From building multimillion dollar hotels, to do it yourself home repairs, we all need it... the pencil. So what makes a pencil a Super Pencil™ ? It must have super powers of course. The Super Pencil looks very similar to your average carpenter pencil, but aside from that, they are nothing alike. OK enough with the small talk. Lets get down to the features. It is wood free. That's right boys and girls, a non-mechanical pencil without a wooden exoskeleton.This means it has a 100% writable surface. That should make the tree lovers happy. It is made completely from a non-toxic graphite composite. That should make the environmentalist happy. It is flexible, and water and smudge resistant. Something that should impress the Olympic gymnastics and swim teams. It is extremely durable, never needs sharpening, marks on wood, paper, and concrete, and lasts seven times longer then wooden pencils. Something we all can love. Sounds to me like it lives up to its name. 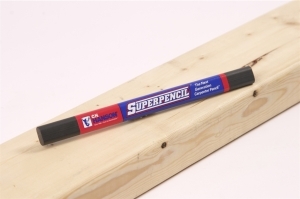 Be sure to check out more cool products and the Super Pencil at C.H. Hanson's website .